John Michael Exquisite Weddings and Catering strives to meet the needs of every client. To help you find the perfect edibles for your event, Michael Thomas designed “A Taste of John Michael.” In this unique, quarterly event, prospective and current clients have an exclusive opportunity to take part in an all-inclusive group tasting. In addition to the group tasting, the event also serves as a comprehensive wedding planning meet-and-greet. One hundred fifty (150) guests are admitted per session at Harry P. Leu Gardens to feast on over 25 of our menu items and meet with Diamond Package vendors. This is an opportune time to get to know our staff and get a feel for your event’s menu items. A Taste of John Michael is a complimentary event. The next tasting will be held on Sunday, April 21, 2019, from 11:30 a.m. to 1:30 p.m. Each tasting event is uniquely different. RSVP is required by April 19, 2019 limited to four guests per party. 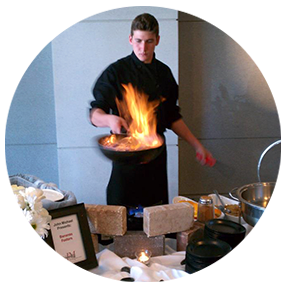 For couples looking to enjoy a more personal experience, “chef’s choice” tastings are available by request.